The more you play the game of golf or any sport for that matter, the more your game will improve. However, your golf training aid will determine the kind of improvement that you will be able to make. Yes, there is a wide range of golf training aid brands that you can get bombarded with by retailers, but it is important to choose the right one. In choosing your golf training aids, you have to be aware of the part of your game that needs to be improved. In any event, you will still need certain training aids for your golf game. Below is a list of the essential golf training aids that you need to keep on hand. If you are a golf player or want to be one, it is best to have a bag of golf clubs at your disposal. No one plays golf without clubs. You don’t have to buy a full set. You can buy half set or you can actually rent them. However, in the long run, renting will turn out to be too expensive. Golf balls are another important commodity and essential to your golf game. If you are new to golf or an avid golf player, the Rope It golf training balls are the right choice. These balls allow you to practice off the golf course. You can practice in your backyard without have to worry or be concerned about losing the ball. The ball is attached to a rope, which means that it can only go a certain distance when you hit it. This golf training ball is unique, easily retrievable and benefits the golf player who does not want to interrupt play by going to look for a golf ball. 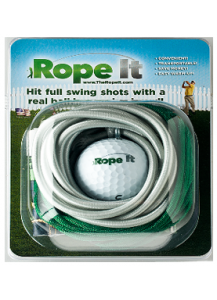 The Rope It training ball is a must have for any golfer. You will need special shoes to play golf, whether you are teeing off at the golf course or practicing in your backyard. You have to make sure that the golf shoes are comfortable and that it can withstand any type of weather while you are on the golf course. Yes, you need gloves to protect your hands and to give you a better grip when you are holding your golf clubs. You also need more than one ball markers. This will help you to perfect your game, improve your golf score, improve your putts and able to identify the golf ball that belongs to you during a golf game. Make sure that you are well equipped to play the game of golf. However, you also need to be equipped by having the appropriate golf training aids. You cannot play golf without the Rope It Golf Training Ball. Get Yours Here!